The joint convention will be held in New Orleans with the AIS convention starting on April 8th, 2018 and ending April 13th. The SLI part of the convention begins April 11th and ends April 14th. Attendees may sign up for any or all of the conventions activities and tours. See the Convention Web Site here.. This is a great opportunity to see New Orleans and to enjoy some fantastic gardens. While visitors will not see any Tall Bearded irises or any of the other species of irises normally seen at an AIS convention, they will see more Louisiana irises than at any other convention. Take advantage of this chance to attend a great and unusual convention. Get your registration in quickly! Let me tempt you with a short preview of some of the gardens on tour. The Louisiana irises in the Botanic Garden in Independence Park in Baton Rouge originated with the efforts of the late Joseph Mertzweiller, a major hybridizer and guiding force in SLI. Joe conceived of the iris garden and donated the irises at the core of the original planting, most of which survive in a well planned setting that makes them readily accessible to the public. There is no charge for admission to this Garden, which also features daylilies, roses, herbs, camellias and crape myrtles, and gingers. Original plans for the garden called for the construction of an “Iris Pavilion.” With admirable long term adherence to the plan and the support of volunteers as well as Baton Rouge Recreation and Parks, the Pavilion now sits in a prominent place in the Garden. The Garden will feature Guest Irises for the Convention and other recent cultivars as well as many of Joe Mertzweiller’s tetraploid and diploid irises. A nice mix of old and new cultivars. Gary and Leigh Anne Salathe’s pond near Madisonville, LA, is testimony to inspired vision and perseverance. 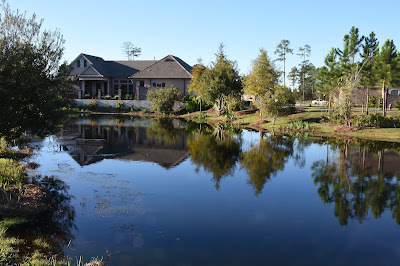 The pond is in a subdivision common area adjacent to their home. With the farsighted support of subdivision owners, Gary has turned it into a beautiful and unique destination. 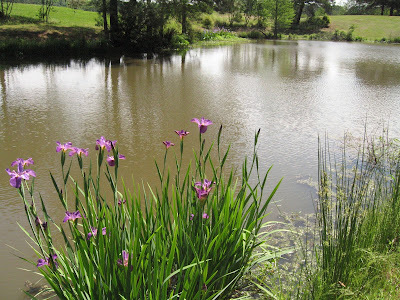 “A Louisiana Pond” displays a mix of irises, including all five species, including I. hexagona from Florida, a few natural hybrids, and old and new hybrid cultivars. It is evolving year to year with more and more hybrids to accompany the original planting that included lots of I. giganticaerulea and I. virginica, a native iris not in the Louisiana group. The Black Swamp is a small bottomland, rain-fed swamp that probably was a river-fed swamp before the building of levees. The canopy consists of water tupelo and black tupelo with some swamp red maple. The tannins leached from the leaves of the black tupelo make the water appear black, although it is actually a clear light brown. No irises were found in this swamp, although it looks as if there should have been. In 2015, Benny Trahan donated 200 rhizomes of I. giganticaerulea, fulva and nelsonii, which were planted by members of the Greater New Orleans Iris Society at the request of Burden. At the time of the planting, the water level was so low that it was possible to walk through without boots. Many of the irises planted were just starts about six inches tall, and when the water returned, they were inundated before they could become established. Only about sixty or so survived, but those have thrived and are forming large clumps that look as if they are in their native swamp habitat. The first good bloom of these plants occurred in 2017. The Rural Life Museum is the best known of the several components that make up LSU’s Burden Museum and Gardens. The spectacular Windrush Gardens sits adjacent to Rural Life, and both are but small parts - in terms of space - of the entire 440 acre Burden property. A developing LSU AgCenter Botanic Garden, which includes the Black Swamp, is another component, and a great deal of additional space is devoted to agricultural research. A highly recommended trip to the Burden website will do far more justice to the Rural Life Museum than is possible here. On the Convention tour, Rural Life, Windrush and the Black Swamp will all be available, but one could easily spend an entire day at Burden. Rural Life consists of a “village” of over 30 unique buildings and a Visitor’s Center displaying an extensive collection of artifacts. Windrush Gardens was designed by Steele Burden and covers 25 acres of mostly shady paths interspersed by mature trees, azaleas, camellias and crape myrtles. It is decorated with fascinating, old architectural features, especially statuary. On the perimeter of Windrush Gardens, several large ponds feature plantings of older varieties of Louisiana irises. There is too much shade in the Garden proper for Louisiana irises to thrive. Burden is not a property that features Louisiana irises, although a significant planting is planned. Irises will be seen here and there in various locations, in the Windrush ponds, in the Black Swamp and in another old pond nearby that also contains many specimens of I. virginica. This is just a sample of the many gardens on tour during the conventions. Attendees will also have time to visit the famous French Quarter and other attractions in the city of New Orleans. To learn more about Louisiana irises, visit the Society for Louisiana Irises web site. To learn more about the American Iris Society visit the web site. To learn more about New Orleans, visit this web site. Other tours during the convention include the Longue Vue House and Gardens. The Sidney and Walda Besthoff Sculpture Garden contains over fifty sculptures and many plantings of Louisiana irises. You also do not want to miss seeing the New Orleans Botanical Garden. Did I mention that the National World War II Museum is also located in New Orleans and is the place to visit if you are interested in WWII. There are just too many other great places to visit in the New Orleans area. So, pack your bags and head out to New Orleans in April! Hope to see you there.